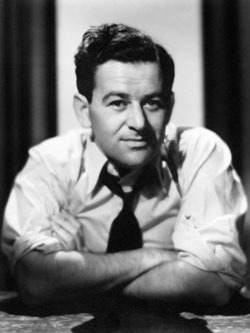 William Wyler, who already had two decades of filmmaking under his belt before the war, was among these men. While serving overseas in the US Air Force he made three masterful and influential documentaries, often at great personal risk. But of course by this point he was just another soldier, wielding a camera alongside his rifle. Wyler came home partially deaf after being regularly exposed to the thunderous aircraft engines and was concerned that this disability would affect his capacity to direct films. Instead, it endowed him with a sense of compassion and understanding that he was able to channel into several of his best films. After three years filming the skies of the European theater, William Wyler came home and turned his camera on the ground floor of post-war America. 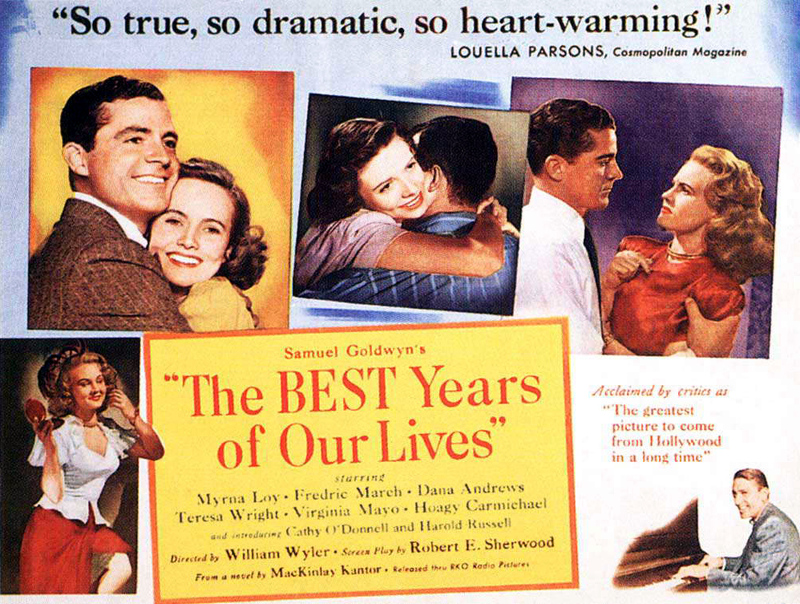 The best and most immediate of Wyler’s apparent mission films was Best Years of Our Lives, a 1946 masterpiece that chronicles the lives of three veterans coming home after their tour of duty. These men are returning to a society that has changed, and not necessarily for the better. With its pulse firmly attached to the societal undercurrents of this shifting America, the film was able to be progressive in a way few American films had attempted. Not every returning GI was able to waltz through Times Square and plant a kiss on the nearest dame. Even if they were, they would eventually return to their city, their community, their job, their family. This was (and is) no easy feat. On this viewing of Best Years I was amazed how relevant it managed to be. Every look of despair and moment of disappointment experienced by the characters is able to echo through time and resonate in our current landscape. Soldiers are returning home from the Middle East, facing the same problems as these World War II soldiers. And as long as there are wars being fought, Wyler’s Best Years of Our Lives will be a perfect mirror by which to analyze and appreciate returning soldiers. 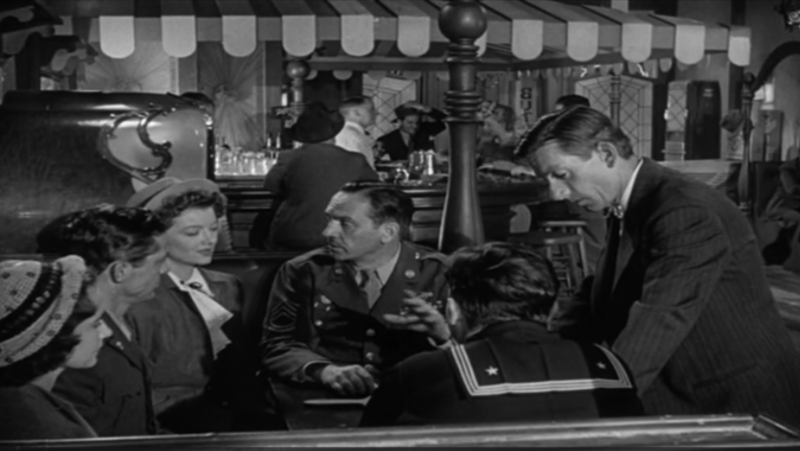 The film is able to maintain its relevance because of Wyler’s use of symbols and metaphors, intentional or otherwise. Every narrative element in the film can be boiled down to a timeless piece of realism that remains analogous to the following generations. 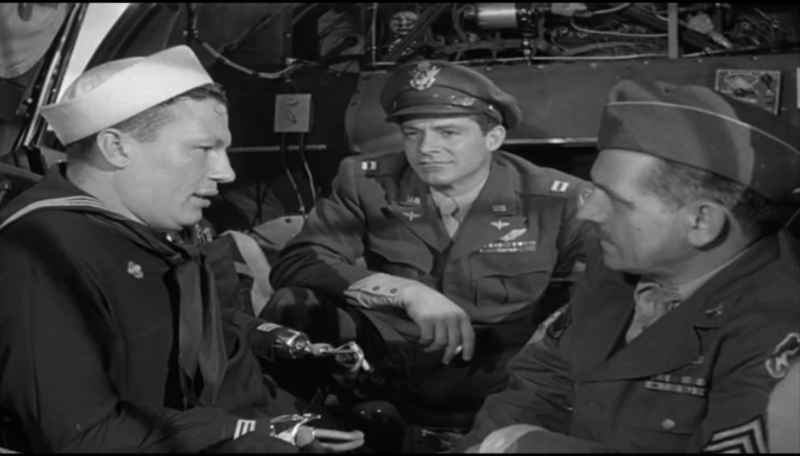 The film revolves around three veterans but it is outlined with care and precision by a fourth: Wyler himself. In his hands, the camera becomes a conduit through which shockingly familiar symbols and subjects are projected to anyone who’s willing to listen. The film’s realism — surprisingly, it avoids sinking into pessimism — is on display from the very first scene. War is over, and soldiers from all over the world are flocking home for a chance at normalcy. You’d expect some sort of proverbial red carpet that spans the Atlantic, but these men can’t even secure transportation home. They’re stuck in a crowded, muggy airport waiting room where flights home are cancelled and negotiated. Military rank and class no longer matters, as everyone is vying for a plane trip that will drop them even remotely near their home. Among this mass of men are the three veterans we’ll be following, each hailing from the same city. Eventually, after their initial flights are cancelled and rearranged, these strangers end up on the same plane home, stuffed into the storage bay of a large military bomber. And as they fly home on what may be the last flight this particular airplane completes they guess wildly at the landscape that flashes below — it’s the rug that’s being unwittingly ripped out from under their expectations. This plane ride is where the men meet and swap war stories, but it’s also the last time they will enjoy being above the society they’ll soon land in. When the wheels skid onto the runway, they will be under a rule far more complicated and difficult than military law. In civilian life there’s no black and white, no right and wrong, and no one is sure what to do with yesterday’s heroes. They will now be governed by the shifting nuances of America’s homefront: it’s perception of the War and the returning veterans, the looming threat of yet another conflict, and the country’s attempt to immediately move on and forget the last several years. 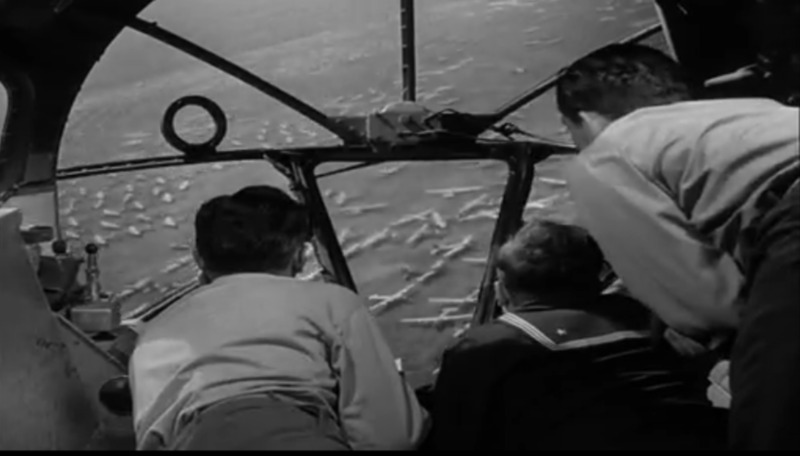 Wyler uses this flight home to establish the thematic outline he’ll be exploring throughout the rest of the film. And this is the same outline that resonates so well in our post-Iraq and Afghanistan world. There’s a cautious optimism among the three men as they express their excitement at returning home, but apprehension is written across their faces. 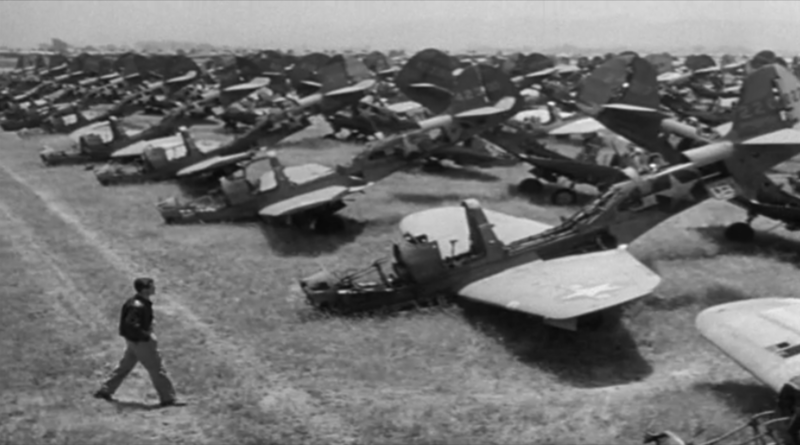 As they begin their descent into Boone City they fly over a massive junkyard full of dismantled bombers. Fred Derry, who spent the war piloting similar aircraft, comments that “some of them look brand new, factory to the scrapyard.” After a pause, he continues “that’s all they’re good for now.” While never expressly stated, Wyler adeptly foreshadows the trajectory of these men; straight from the factory of war to the scrapyard of society. But who are these vets and why do their struggles remain so timeless? Wyler and screenwriter Robert E. Sherwood fill the script with characters and situations that represent the widest possible breadth of experiences. The main three branches of the military are represented, as well as a variety of social classes, ages, relationship statuses, even mental and physical scars. Wyler and Sherwood fashion a narrative that is honest and self-reflexive, full of nuances that veterans from any generation can relate to. Even Boone City itself is fictional, which allows it to act as an effective stand-in for anywhere in the country, from small towns to large metropolitan areas. Thankfully, these characters are never reduced to simple stand ins for a particular branch of the military. They’re men of flesh and blood, and the fact that they’re returning home with an indescribable weight is never ignored, but continually explored. The three men are at their happiest as a unit, whether it be a rendezvous at a local bar or a fortuitous run-in on the street. It’s obvious that this comfort stems from so much more than a routine or or nostalgia; the horrors of war have to be seen with your own eyes, and our heroes only feel safe and understood in the company of those who can relate. 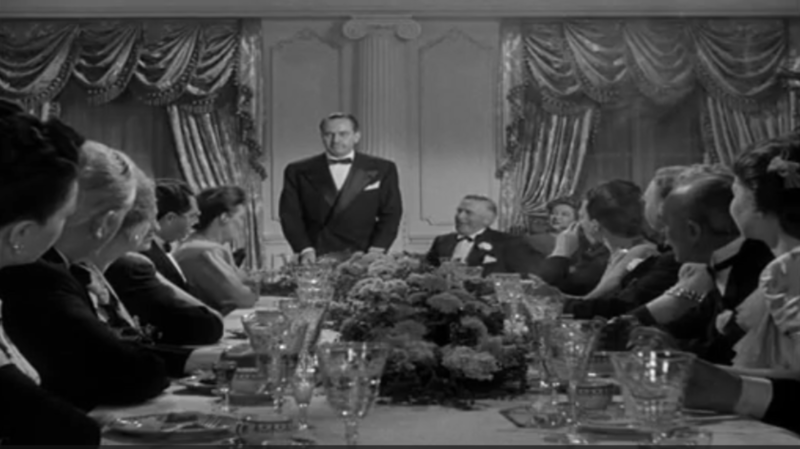 Representing the Army is the oldest and most successful of the trio, one Al Stevenson (played by Fredric March, the most successful actor of the film as well), who returns home to two children he doesn’t recognize and a banking job that asks him to forget the comradery soldiers share with each other. He’s unable to turn his back on GIs and is reprimanded for granting loans to soldiers without “collateral.” As a coping mechanism, Al turns to alcohol, providing a muted representation of alcoholism that’s played as often for charm and laughs as a serious condition. Despite its lighthearted approach Stevenson’s reliance on alcohol still stares the audience in the face, arguably even more when Best Years is viewed through a 21st century lens. We’ve all heard stories of veterans returning from modern conflicts – there’s been what, four major wars since World War II? – and immediately turning to substance abuse as a way to cope with their battered psyche and readjustment. In Best Years of Our Lives, Al Stevenson is ostensibly the most fortunate of the soldiers we spend time with, yet he still suffers from the mental plagues of war and homecoming. Fred Derry (Dana Andrews), the Air Force pilot, can think of little more than his beautiful, young wife Marie (Virginia Mayo) whom he married a mere 20 days before his initial deployment. Like so many other women left on the home front, Derry’s wife has become independent, taking a job at a local night club and moving out of the small, dingy home she shared with Derry’s parents. After a colorful war record, Derry has higher ambitions than his pre-war position as a “Soda Jerk” at a local drug store. Unfortunately, opportunities don’t present themselves and Derry finds himself back behind the counter, managed by an embittered, rotten young man, and peddling perfume to self-entitled shoppers who are wholly unconcerned with his personal sacrifices. Even his wife has little patience for his past and does the bare minimum to help him move on. She insists he wear his Air Force uniform when they go to fancy dinners and mocks him for his horrifying night terrors. After burning through his GI stipend on fancy dinners and clothes for herself it becomes clear what Marie really values: her soldier husband is yet another of her status symbols and she has no problem swapping this model out for one that’s better adjusted. Derry’s narrative shows the inability of society to actually recognize and even compensate the emotionally scarred young men returning home. Derry isn’t looking for much, only a way to apply the skills learned in the military to a meaningful career. The American Dream, as it were, which he spent several years fighting for. Instead, his PTSD goes undiagnosed and the classist construct refuses to see his worth. In an insightful stroke of destiny, he eventually finds work in the very scrapyard he flew over at the start of the film. Of course, this only comes after Marie divorces him and he’s fired for assaulting a customer who claimed that the Nazi Party had it right all along. 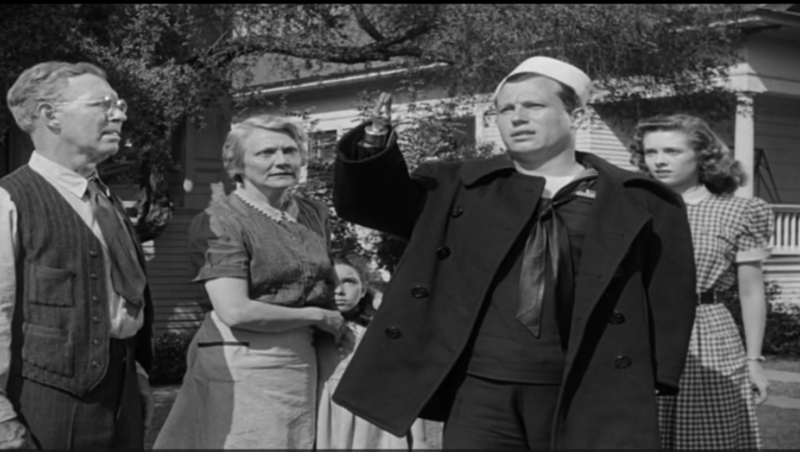 Wyler’s most assured and progressive decision was to cast Harold Russell, an actual double amputee, as Homer Parrish, the young Navy Sailor who returns home without either of his arms. Russell lost his arms in the war, just like the character he embodies, after a stateside explosion at his military base. While Parrish doesn’t get the screen time or narrative weight as his Hollywood counterparts, he’s a fully realized symbol of the physical effects of war. His presence and performance do more than any piece of acting ever could. Russell is great, but he lacks the polish of Fredrich March or Dana Andrews; it’s almost as though Wyler knew this would actually help the film, as it adds to Parrish’s insecurity and detachment from the world he knew. When Harold Russell (as Homer Parrish) stares at pictures of himself from before the war, whether it be throwing a football or holding a cute girl, real pain flashes across his face. There’s nothing fake here. 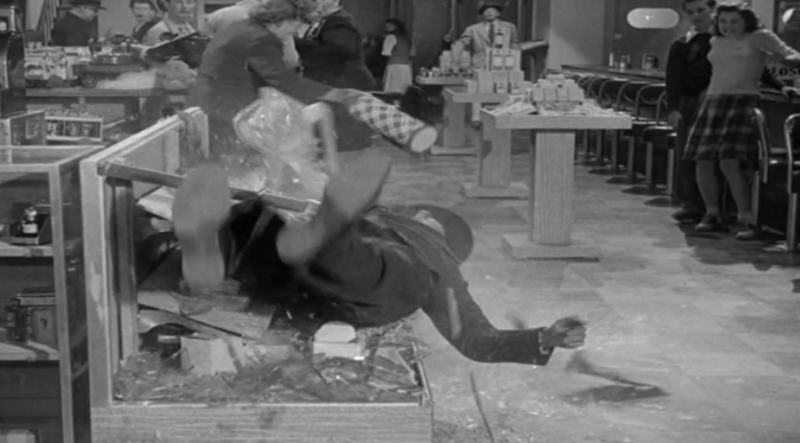 At times, Homer Parrish is reduced to the film’s unofficial cheerleader to Al and Freddy, encouraging them to keep their chin up and providing a tangible reminder that things could certainly be worse. This minor complaint aside, Homer’s presence in the film still manages to be an invaluable asset. He’s the glue that holds Best Years of Our Lives’ moral fibers of indignation and loss together. Homer’s representation, which may have been harrowing for audiences at the time, never reaches a Freaks level of showiness, even in the few extended scenes where he illustrates to characters, the camera, and us how well he’s able to use his new hooked hands. There’s an early dinner scene in the film with Al and Freddy where Al instructs his family that Homer is missing his hands and that’s the end of it. No discussion is needed, and staring is discouraged, thank you very much. 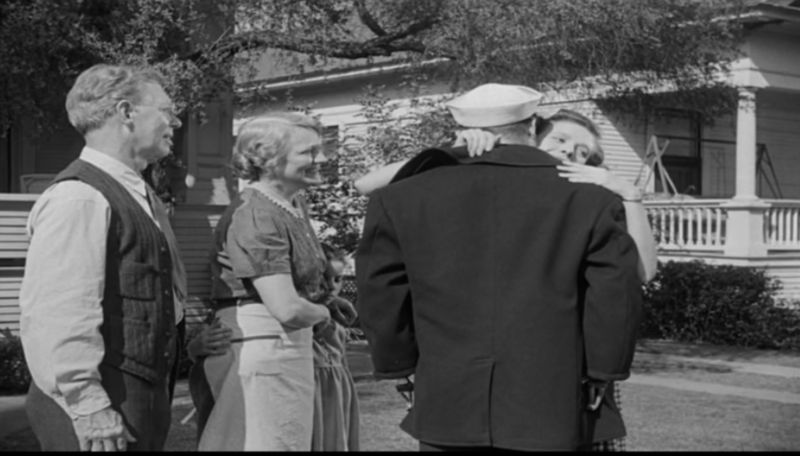 This sort of instruction regarding the treatment of returning veterans continues throughout the film until it becomes obvious that this is Wyler’s point: to instruct and, if needed, reprimand. He wants to humanize these soldiers who are so often misrepresented in films and in life. They’re heroes, yes, but thanking them and shaking their hand doesn’t erase their nightmares or provide job training. By including the physically wounded Harold Russell, Wyler gives us an immediately sympathetic anchor that compels us to think compassionately about these men. Homer’s wounds are mental as well as physical and we start making connections and drawing lines between his visual post-war condition and the subterranean scars all three men share. By the end of the film, every returning soldier from any conflict can be represented by these three men and we can (and should) start to help them. It’s not the military’s job to teach soldiers how to embrace their loved ones back home, but we’re still to this day struggling with how to facilitate readjustment to civilian life. Homer spends his time at home in self-imposed isolation, particularly from Wilma, opting to shoot his rifle in the barn rather than discuss their future together at any length. Truth is, he’s scared that she’ll be repulsed once she sees his nighttime routine and the full extent of his injury. How could she stand to be married to such a man? Wyler offers a solution where the military falls short, but it’s not a widespread or easy solution, especially for the soldiers. It’s entirely dependent on the loved ones waiting at home. He suggests that healing comes from compassionate loved ones and Wilma’s ultimate acceptance of Homer’s condition is one of the film’s best scenes. As a final attempt to solidify his isolation, Homer takes her up to his room to show her how he puts on his pajamas. Fred was right, Homer is amazing with the hooks, but he’s still unable to fasten his shirt buttons. In a move that’s almost as surprising for us as it is for Homer, Wilma steps out from the shadows and fastens them for him as though it was the most natural thing in the world. Granted, Wyler’s prescription doesn’t work for every soldier, then or now. But Best Year’s legacy is strengthened by the simple fact that Wyler was acutely aware of the problem and tries to answer it as best he can. Eventually, compassion will find a solution. I’m convinced that The Best Years of Our Lives couldn’t have been made by a director other than William Wyler…at least not this well. It’s lengthy but never too long, pointed but never too pained, and exceptionally human without slipping into melodrama. Thanks to Wyler’s astute use of broad symbols, perfectly embodied by a trio of authentic characters, the film will be an invaluable ally to returning soldiers for as long as there’s war. The key is compassion. These men had the fortune of fighting a popular war when so many of our modern soldiers are met with disgust. Even then, we see how readjustment to civilian life can still be yet another battle for these men. Audiences watching today will undoubtedly catch these patterns and be encouraged to approach these men as human beings.